Most people, at some point in time, struggle to shed some extra weight. Obesity in humans has reached epidemic proportions and in a study released two years ago, South Africans were classified as the third fattest people on earth. Worse than this, is the fact that obesity in pets is following this trend and fast becoming a disease on its own. Some studies show that more than 50 % of pets are overweight. This alarming figure effectively means we are “killing our pets with kindness.” Obesity is defined as an accumulation of excessive amounts of body fat. Body fat increases when the amount of energy taken in (by eating food) exceeds the amount of energy used (by exercising). Vets classify a pet as obese if the animal weighs more than 15 to 20 % of his/her ideal body weight. Body Mass Index or BMI which is commonly used in humans to define obesity is not commonly used in animals, because there is such a huge variation between and within different breeds. In animals, a Body Condition Score or BCS is referred to in terms of the animal’s ideal weight. owner related and environmental factors – overfeeding, excessive treats, and no exercise. Obesity in humans predisposes us to conditions like diabetes and heart disease. Animals are no different and as in humans, there is a myriad of other diseases and conditions which stem from being overweight. Statistically, humans and animals that are overweight have a shorter lifespan and a reduced quality of life. 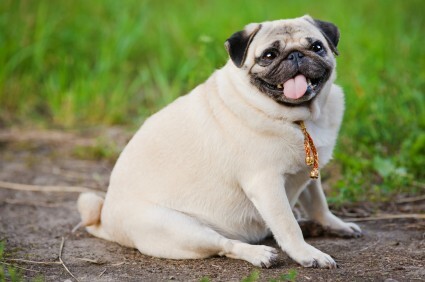 Apart from the excess weight which has to be carried around by an overweight pet, leading to conditions like arthritis and muscle fatigue, there is also the side effect of fat accumulation in organs and everywhere else around the body, which leads to organ failure and weak muscles. A classic example of over-accumulation of fat in an organ is fatty liver syndrome in overweight cats. The cat’s body loses the ability to metabolise fat (use up it fat resources) properly which leads to excessive fat accumulating in the liver which in turn leads to premature death. Other conditions and diseases which stem from obesity are diabetes, hypothyroidism, hyperadrenocortisism also called Cushing’s disease (overproduction of cortisone by the body), slipped intervertebral disks, cruciate (inner knee) ligament rupture, collapsing of the airway, hypertension or high blood pressure, heart disease, cancer, skin abnormalities, bladder stones, urinary tract infections, dystocia (difficulty in giving birth), heat intolerance and being an anaesthetic risk. For veterinarians an overweight pet is often a difficult patient to examine, assess and diagnose as the vet cannot feel all the structures properly in your pet’s abdomen or hear his/her heart and lungs optimally. This may cause the vet to miss a subtle problem (like a growing tumour) and not diagnose it well in advance. 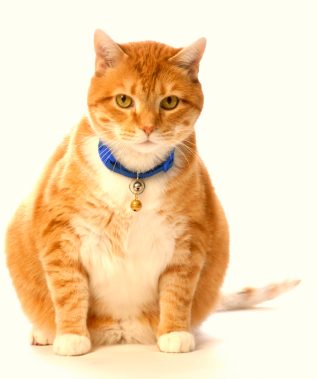 So how do you know if your pet is overweight? All breeds have an ideal weight range which has been published in numerous books and articles on the internet. A useful tool to use is the Body Condition Score. Ideally, your pet should have a Body Condition Score of 3. This means that your pet’s ribs can be felt when you stroke their chest lightly with the back of your hand. If the skin and musculature underneath your fingers are completely smooth, the animal may be overweight. If the skin is tight against their ribs and you feel every bump, they may be underweight. Dogs must have a waist and abdominal tuck. Cats should also have a waist and an overweight cat can immediately be spotted because of a fat pad developing on the lower abdomen (tummy) between the back legs. If an animal has a body condition score of 3, their body fat percentage should be somewhere between 1 and 24 %. If you are not sure if your pet is overweight, you can ask your vet to show you how to do a body condition score. Fortunately, there is help out there if your furry friends need to lose weight. Keep in mind that weight loss in animals can be just as difficult as weight loss in humans. Our pets have one advantage though….... they cannot go to a store and buy food. They rely on their owners to feed them, and of course to exercise them! As with human weight loss programmes, exercise forms a pivotal role in weight loss. Feeding the correct diet and the correct amounts of the right food are central to weight loss, but the overall results are so much better if it coincides with a proper exercise regimen. Taking your dog for a 30 min walk 3 to 4 times a week can make a world of difference in reducing weight, and once that weight has been lost in maintaining the ideal body weight. If at all possible, walking off the lead or walking on a longer lead tends to give the animal more exercise than walking right next to the owner on a short lead. Playing on the lawn or beach, or throwing a ball to an overweight pet can be very effective exercise. Dogs that suffer from arthritis or any other joint problems can be taken for a swim. Swimming is excellent exercise and does not have the same impact on the joints as walking or running. Cats can be exercised by being lured up and down stairs (or jumping up and down a table or chair) a few times around feeding time. Some cats will also chase a laser light and this too can be used to get them more active. Decreasing the amount of food, and starving your animal, is almost as detrimental as overfeeding them. With the help of the vet you can establish which diet is the correct one for your pet and exactly how often, and what quantity to feed your animal. Maintenance diets are balanced and formulated to provide the correct amount of minerals and nutrients. A controlled decrease of a maintenance diet will certainly contribute to weight loss; however animals that are obese or more than 5 to 10 percent overweight need special diets and special attention. For these animals there are specially formulated light and weight reduction diets, which usually have reduced fat and reduced refined carbohydrate components, but are still balanced to ensure proper nutrition. Light diets are usually effective for animals that are mildly overweight or for animals that have lost weight and where the lower weight now needs to be maintained. In certain instances a light diet may even be used to keep animals which are at the correct weight, at that weight, and to prevent them from picking up weight again. The approach to put an animal on a light diet, can be especially useful for breeds which are prone to becoming overweight once they have been sterilised. A veterinary weight loss diet, or calorie restricted diet, is formulated for dogs or cats that are more than 5 % overweight and contains ingredients that help them burn fat and keep the weight off once they have lost it. Some weight reduction diets contain more fibre which helps them to feel fuller for longer as it works in the satiety centre of the brain (the part in the brain that tells them that they have eaten enough). Some weight reduction diets have a low glycaemic index (Low GI), which allows energy from the diet to be released over a longer period of time, which in turn stabilises the blood sugar levels and allows fewer calories to be converted to fat. Ask the vet or staff at the veterinary practice for more information if you are not sure which diet your animal should be using. In a controlled weight loss program environment, your pet’s goal is to achieve a 1 to 2 % body weight loss per week. For example, a Labrador weighing 45 kg, the ideal weight loss per week should be between 450 and 900g. This converts to a 1.8 to 3.6 kg loss per month. If your pet does not achieve this goal with the adjusted diet and regular exercise, ask the vet to do a general check-up, as a medical condition may be prohibiting the pet from losing weight. Most veterinary practices run weight loss clinics and diet and nutritional assessment programs (backed by excellent research from veterinary pet food companies). At these clinics, a structured feeding and exercise plan can be designed especially for your pet and your pet’s progress will be monitored with a weigh in on a one to two weekly basis, until your pet has reached his/her desired weight. There is nothing cute about a podgy pet. A lean and healthy pet is a happy pet.